Stempelwalküre „Gelassenheit“ Catalogue Sneak Peek! Here is my first project using products from the upcoming catalogue! I decided finally to do some scrapbooking like I did so avidly for years. I was all set to make some cards with this fabulous stamp set and matching Thinlits, but then the sun came out and all of a sudden I had that holiday feeling! This idea was inspired by a layout which I saw using one of these stamp sets at the Stampin‘ Up Convention in Wiesbaden at the begining of this month. I knew at that moment that these sets were „MUST HAVES“!! I will be hosting on the 6th of May a party to introduce a pre-catalogue special. 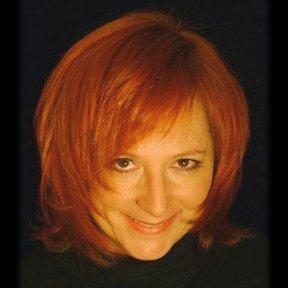 If you are interested in coming…(and of course) FREE PRODUCT with your purchase… just send me an email and I will put your name on my list for my event! Here are a few projects that can be created with this great offer! Come and check it out on May 6th at 14:00! You will be able to pre-order a fabulous set of NEW coordinated products all together and recieve FREE PRODUCTS to go with your special pre-purchase! Don’t miss this great opportunity! Es ist soweit! Hier sind die Auslauflisten ! Viel Spaß beim stöbern! Ich werde Abends ab 20:00 bestellen. Sag einfach Bescheid sobald du etwas entdeckt hast, und ich bestelle es für dich gerne! Alles nur solange der Vorrat reicht! I have always loved coloring…but alcohol markers make it even more fun! I love the depth of color, saturation, shading and blending possibilities that they give you. Sometimes I just stamp a whole piece of paper and then start coloring! I love that the results are so professional with very little skill needed :-D. Stampin‘ Blends are great because they coordinated with my other Stampin‘ Up products. I have been coloring simply when the spirit moves me and then figuring out later which project I want to do with the images. It seems a little backwards, but it keeps things interesting! I adore using this new stripy impressions folder. Not only can it be used it for horizontal and vertical stripes but put it in the Bigshot in both directions and have caro. Great for masculine cards. I can put my card in the folder at an angle and have diagonal stripes too! Very, VERY useful! Also very useful are the candle stamped images…not only for birthdays but for xmas cards too! So much FUN and very simple! Stempelwalküre – I LOVE BRUSHO!!! 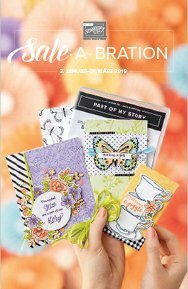 I just LOVE this card made with the Sale-a-bration stamp set available FREE with a purchase of only 60€! I used thick Aquarelle paper from SU to take advantage of the beautiful deep pigment of my BRUSHO CHRYSTALS and fabulous water color effects easily achievable with this great product! First, I stamped my background with Versamark ink and then heat-embossed with white embossing powder. This is a great technique for creating fun background designs. After this, I applied water with a water tank brush and sprinkled Brusho VERY sparingly on each area, letting it dry first before moving onto the next color. The most difficult part of this technique is the „waiting“ for it to dry. I am not very patient when I am in the flow 😀 ! For people like me, I suggest you use your heat gun. But be aware that using your heat gun will change your resulting design. I did one card practicing PATIENCE and one IMPATIENCE card, the results are both very good BUT, to be honest, the „patient“ card had more deepth of color, dimension and more interesting designs. What I thought about trying next time, was perhaps to take one large piece of aquarelle paper (for example A3) and do a huge background all at once, then chop it up later into different sizes to fit the cards or other pieces I wish to create, as I go along. Just an idea! Here are some cute ideas for extra quick cards and boxes with your Memories and More Sets! So I have begun to do just that! I am having great fun taking these sturdy little cards and using these coordinating images to make VERY easy gift boxes and enhance matching cards! YAY! Stempelwalküre – Wishing you a magical 2018! I am happy to share with you the little Make & Take we made for my open house. Although I do not have any small children anymore, I decided that the images were so cute, that I had to have this stamp set for myself. 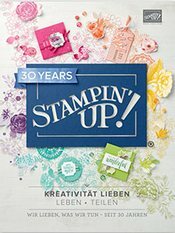 I am having a wonderful time with the new „full set“ of Stampin‘ Blends! (alcohol based markers) Although you can buy them individually or in Combination Packs of light and dark… I am a collector at heart and had to have ALL of them at once! I love to have a choice! I think that everyone enjoyed this very easy project. All it took was an A6 card blank with the front panel scored in the middle to be folded into a simple easel card. This is a very practical form because it fits perfectly into your regular sized envelope! 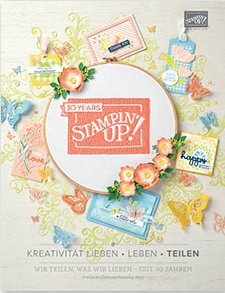 I am planning some consulting appointments for crafters who are interested in joining my team or just want to get started crafting with Stampin‘ Up products. You are welcome to contact me for an appointment, I would love to meet you! Just send me an email and I will get back to you as soon as possible.